The light-middleweight boxing fight between Mayweather and McGregor will take place in Las Vegas on the August 26 and could earn each fighter up to $100m – making it the richest boxing event in history. Are you backing Floyd Mayweather to win? 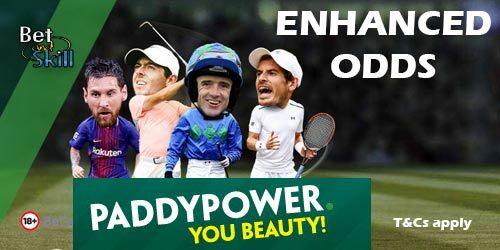 Read here how to get 20/1 Mayweather to beat McGregor at Paddy Power! 3. If your your bet is a winner, you will be paid out straight away at the normal price and you'll be topped up with the additional amount in free bets within 24 hours. Deposit £5 or more. Customers using Moneybookers or Neteller to deposit will not qualify for this offer. Place your FIRST BET on Floyd Mayweather to beat Conor McGregor at the enhanced price through Power Play Plus price on site. The maximum stake for this offer is £1. If your selection wins, you will be paid in cash based on the normal price on site and will have the extra amount, bringing the bet up to the cumulative 20/1 payout, credited in free bets added to your account straight away. This promotion is live until 04:00 on Sunday August 27th and any bets taken after this time do not qualify. "Back 20/1 Mayweather to win vs McGregor at Paddy Power!"